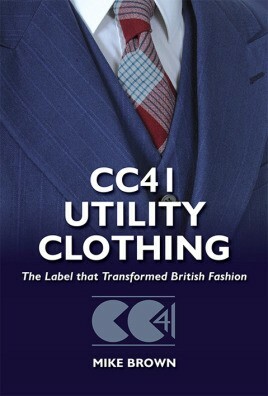 The Utility symbol, CC41, is one of the most iconic symbols in the history of clothing in Britain; instantly recognisable to anyone who lived in Britain through the Second World War or the immediate post-war years. Clothes rationing began in June 1941 in an effort to cut down the nation's consumption of scarce resources; the Utility scheme was started 3 months later as a method of providing cheap, but well-made clothes for the less-well-off. The scheme was such a success that over the next few years it was extended to cover goods as widespread as shoes, furniture, lighters, pencils and household linen. Mike Brown looks at the background to, and the evolution of, the clothing scheme and the symbol as it changed to include more items of clothing, from underwear to fur coats. He also addresses the often misunderstood subject of 'Super Utility', and the so-called 'Dinner plate' mark, uncovering the truth behind a subject shrouded in mystery since its introduction. From somewhat hit-and-miss early garments, through to 'the Couturier scheme', the Utility symbol grew to be a mark of quality and value, which, post-war, slowly deteriorated until many were removed from clothes as a symbol of 'cheap and cheerful', and often not even cheerful clothes. A fascinating explanation of a little understood scheme with a wealth of knowledge complimented by colour photographs and original illustrations throughout.